Victor Batista is professor of chemistry and has served as director of undergraduate studies at Yale, 2008-2010, and as senior editor of The Journal of Physical Chemistry since 2011. After receiving his B.Sc. degree in chemistry at the Universidad de Buenos Aires, he continued his studies at Boston University, UC Berkeley, and the University of Toronto. His research is concerned with the development of rigorous and practical methods for simulations of quantum processes in complex systems, and with applied studies of photochemical and electrochemical processes in: proteins, semiconductor materials, aerosols, and catalysts for the chemical conversion of carbon dioxide and water. 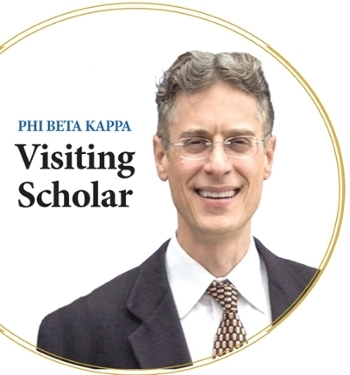 His honors include the National Science Foundation’s Presidential Early Career Award for Scientists & Engineers, the Camille Dreyfus Teacher-Scholar Award, an Alfred P. Sloan fellowship, and co-chairmanship of the 2016 Vibrational Spectroscopy Gordon Research Conference. The development of cheap, robust, and efficient photocatalytic cells for water oxidation would allow the sustainable production of fuel from renewable resources. An example of such a cell involves hydrogen evolution at the cathode, thermodynamically driven by photoanodic water oxidation. The underlying photocatalytic process generates fuel (e.g., hydrogen) from water by using solar light to extract cheap electrons and protons from a renewable resource (e.g., water). The generated fuel is environmentally benign since, upon combustion, it generates only heat and water. The development of such type of photocatalytic solar cells based on inexpensive (e.g., earth-abundant) materials has been a long-standing challenge in photoelectrochemistry research, and significant effort has been invested since the discovery of ultraviolet (UV) water oxidation on n-TiO2 electrodes. However, for many years, progress in the field has been hindered by a lack of fundamental understanding of the processes that limit the efficiency of photocatalytic mechanisms, analogous to those responsible for photosynthesis in green leaves. Therefore, an outstanding challenge is to elucidate the underlying mechanisms that Nature has developed to convert water, CO2 and solar light into fuel. Such understanding is essential for the design of photocatalytic solar cells based on natural principles. 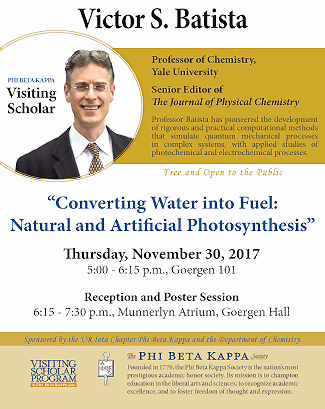 This talk will summarize recent advances and outstanding challenges in that scientific journey of great academic and technological interest that involves understanding natural and artificial photosynthesis at the molecular level. and the Department of Chemistry.